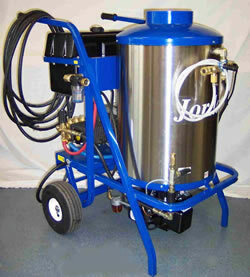 For professionals, by professionals, Jordan Pressure Washers are the choice of today's cleaning contractors. Since 1981, these machines have been engineered, tested, and built for solid performance. They provide the reliability required by today's successful contractors. Our PSI ratings are accurate. You know your team will have all the pressure they require to get the job done quickly and efficiently. Pressure washers are invariably rated very optimistically at sea level operation. 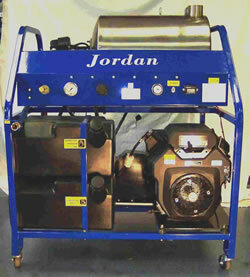 Jordan Pressure Washers are rated at high altitude, with all components working well within their recommended power curves. Jordan washers incorporate an aluminum dissipating tank which vastly increases the cooling efficiency of the pump during the bypass function. This effectively eliminates thermal shock of the ceramic pistons in the pump.